A couple of months ago, some friends invited me to give a talk at NullByte Security Conference. I started to study about some embedded device junk hacking hot topics and decided to talk about cable modem security. Braden Thomas keynoted at Infiltrate 2015 discussing about Practical Attacks on DOCSIS so, yeah, cable modem hacking is still mainstream. On November 21st I'll be at Salvador speaking on "Hacking cable modems: The Later Years". It's not a talk about theft of service and getting free Internet access. I'll focus on the security of the cable modems, the technology used to manage them, how the data is protected and how the ISPs upgrade the firmwares. Spoiler Alert: everything's really really bad. Securing cable modems is more difficult than other embedded devices because, on most cases, you can’t choose your own device/firmware and software updates are almost entirely controlled by your ISP. While researching on the subject, I found a previously undisclosed backdoor on ARRIS cable modems, affecting many of their devices including TG862A, TG862G, DG860A. As of this writing, Shodan searches indicate that the backdoor affects over 600.000 externally accessible hosts and the vendor did not state whether it's going to fix it yet. 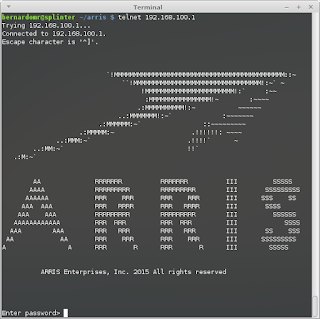 ARRIS SOHO-grade cable modems contain an undocumented library (libarris_password.so) that acts as a backdoor, allowing privileged logins using a custom password. 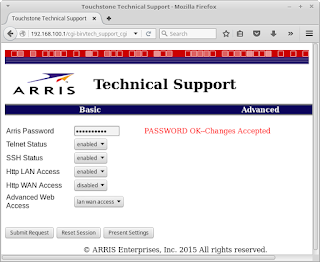 ARRIS password of the day is a remote backdoor known since 2009. 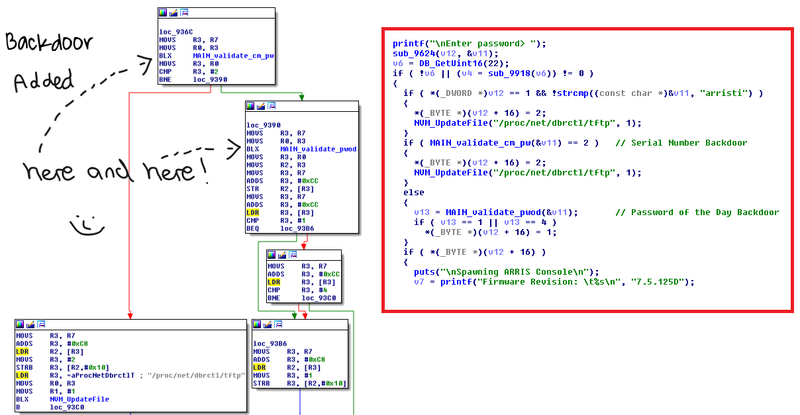 It uses a DES encoded seed (set by the ISP using the arrisCmDoc30AccessClientSeed MIB) to generate a daily backdoor password. The default seed is MPSJKMDHAI and guess what - many ISPs won't bother changing it at all. The backdoor account can be used to enable Telnet and SSH remotely via the hidden HTTP Administrative interface "http://192.168.100.1/cgi-bin/tech_support_cgi" or via custom SNMP MIBs. 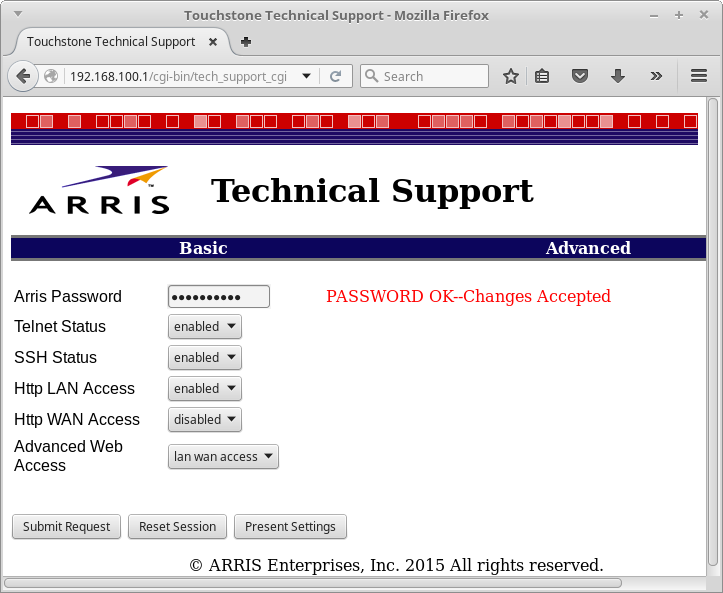 The default password for the SSH user 'root' is 'arris'. When you access the telnet session or authenticate over SSH, the system spawns the 'mini_cli' shell asking for the backdoor password. Yes, they put a backdoor in the backdoor (Joel from Dlink is sure to be envy). The undocumented backdoor password is based on the last five digits from the modem's serial number. You get a full busybox shell when you log on the Telnet/SSH session using these passwords. The vendor asked not to disclose details about the password generation algorithm. I'm really relieved knowing that those awful guys from Metasploit won't be able to reverse this in a timely manner. Of course, we need a logo so the media can report about this with fancy graphs as well as vendors could distribute customized t-shits at Blackhat. What I like most about lcamtuf is how visionary he is. 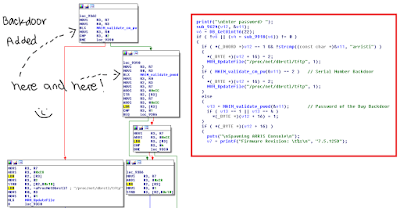 While people were still writing dumb fuzzers, hewrote AFL performed a detailed Technical analysis of Qualys' GHOST. Based on his analysis, I hired a couple of marketing specialists to find out the best way to disclose the ARRIS backdoor. After a thoughtful analysis, the marketing committee advised w00tsec members to write a Keygen. 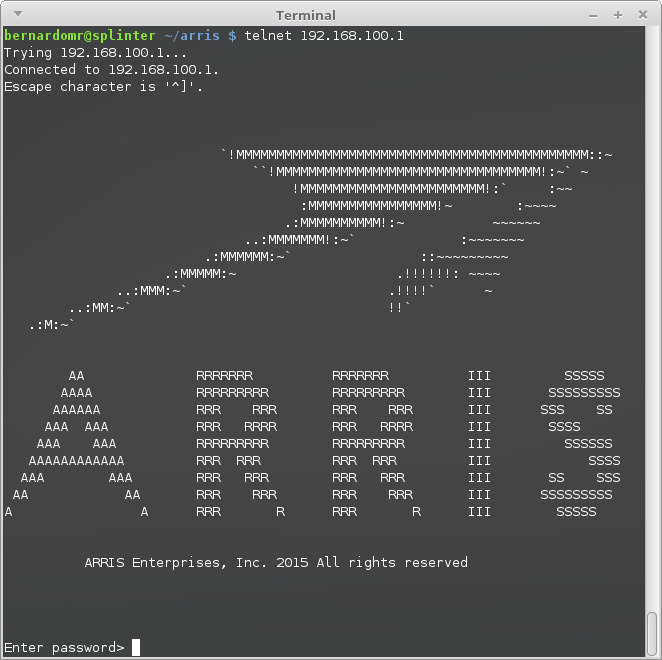 In order to write a Keygen, we need a leet ascii art and a cool chiptune. The chosen font wasROYAFNT1.TDF, from the legendary artist Roy/SAC and the chiptune is Toilet Story 5, by Ghidorah. I reported these flaws to CERT/CC on 2015-09-13 but we didn't receive much feedback from the vendor. CERT/CC was very helpful and responsive (10/10 would disclose again!). I was asked not to release the POCs immediately so I'm going to wait for the vendor to "fix" the issue. CERT/CC set a disclosure policy of 45 days long ago. They waited for more than 65 days for them to "fix" it but ARRIS didn't remove the backdoors in a timely manner. Someone needs to update the Responsible Disclosure RFC and include a note describing that vendors shall lose disclosure points whenever they plant a backdoor on the device (ARRIS modems have a third backdoor too, check theConsoleCowboys Blog). I'm pretty sure bad guys had been exploiting flaws on these devices for some time (just search forARRIS DNS on Twitter, for example). We need more people bypassing EULAs and reversing end-user software and firmware. If you haven't heard about the Firmware.RE, check them right now. A broader view on firmwares is not only beneficial, but necessary to discover new vulnerabilities and backdoors, correlating different device families and showing how vulnerabilities reappear across different products.